Recently, we had a customer looking to improve the efficiency of their food production line. The product was coming down a conveyor and needed to be placed onto trays which would then go in an oven for baking. The company’s current set-up used two employees to grab the products off of the conveyor and place them onto trays while another two employees brought over empty trays and took away the trays filled with the product. Dorner engineered this retracting tail conveyor to speed up the process by placing the products straight onto the trays. The retracting conveyor is an AquaPruf 7400 series equipped with three sensors that detect the presence of the product on the belt. This is a sanitary conveyor that can be disassembled for cleaning in just minutes. The fast motion of the retracting tail is achieved by using a linear servo motor and stainless steel linear bearings. 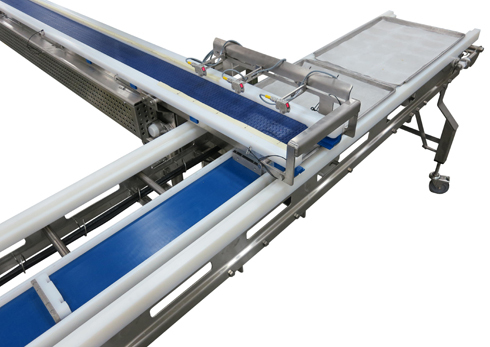 The conveyor moving the baking trays is an AquaPruf 7600 series conveyor. It uses a servo motor and a FDA cleated belt. In order to make sure the trays are in the right location, a sensor is used to identify the cleat on the conveyor belt. The sensors on both of the conveyors are rated for high-pressure wash down. This conveyor is also engineered for quick and easy sanitation. Learn more about our Engineered Solutions Group. I’m looking for buying the Tray Filling Conveyor with Retractable Tail. The diamention of bell is 10 “. Could you please send me the quote. Can you please let me know where your company is located and I will get your request to a representative in your area. Can you please let me know where your company is located so I can get your request to our representative in your area? You can also send us your information at info@dorner.com.